It Is What It Is: Should I Stay Or Should I Go? I have accident prone kids. This shouldn’t come as too much of a shock to me because I’m pretty accident prone myself. I might not be bruised from rough play like Cael or falling down constantly like Graham, but I just get careless and shove knives through my hands or twist my knee funny and bleed internally. 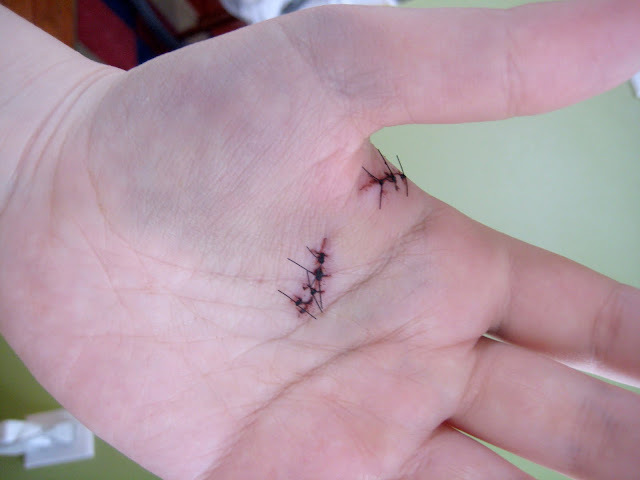 Being clumsy or prone to injury must just be in my blood, so to speak. I know it is in Adler’s blood, because he shows it to me daily by scraping himself against anything sharp, pinching his fingers into tight spaces, and his favorite pastime, falling from great heights. Adler after falling in April 2015. 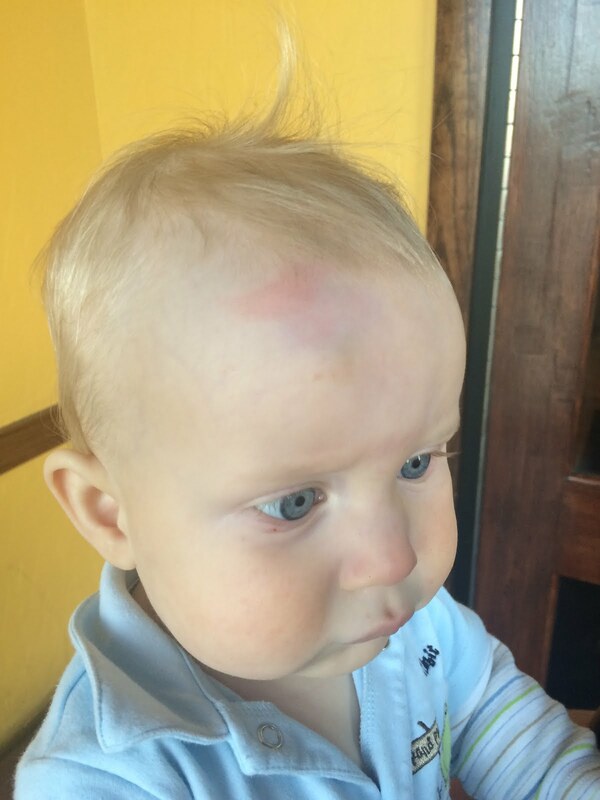 You might remember last fall when Humpty Dumpty Adler fell down the stairs. While that experience left him with a bruised head and a bruised-er ego, he must have concluded that his leap from the first story was insufficient. About two weeks ago, I heard a thump. I had been making lunch and quickly turned to find Adler in an emotional heap on the floor with the largest blue goose egg I’d ever seen. From his position and the noise I’d heard, I concluded that he had quickly scrambled up onto the dining room table and fallen straight off, smacking his thick skull on the hard floor. But unlike other times, he wouldn’t stop crying right away. His eyes looked fine and he didn’t vomit, but he was so sad and so, so, tired. He rubbed his eyes and draped over me like a wet blanket. Since my knowledge about concussions is limited to what have seen on TV, I googled concussion symptoms and found that for every symptom he didn’t have, there was another he was did. Maybe. Fatigue? Yes, but it was naptime. As is often best with toddlers, I opted to distract. I made him a lunch he’d normally love, and planted him in front of it. But instead of digging into his turkey and cheese sandwich, Adler stared blankly at the wall. And stared. Let out one loud cry, and then stared some more. I called the hospital and asked their opinion after describing his symptoms. They did the things hospitals do and told me that without seeing him in person, they could not diagnose a concussion, so they advised me to bring him to the ER because they were concerned about his spot-on audition for “Dazed and Confused”. As I was preparing to load him into the van, Papa stopped by and I brought him up-to-date about Adler’s Big Fall. He agreed that it was best to get him checked out, and as he went to comfort my baby, Adler immediately snapped out of it and tried to steal Papa’s cell phone. Pretended to tickle him. Ran away and straight-up giggled. I have a horrible, horrible track record for making the wrong choice. Of course, I always choose to go, so there has never been a serious side effect from my poor decision-making. Just a lot of bills, a lot of hassle, a few unnecessary hours in the ER, and a grouchy kid the next day. Here’s where I really wish I could say that I didn’t factor those things into my decision, but I did. I thought about Adler’s poor, worn out head and I imagined keeping him up late at the hospital. I thought about him running around and playing with Papa while I considered what an MRI would cost. And in the end, we didn’t go. Adler took a much-needed nap while I hovered over his crib, checking for any signs that his condition was worsening. When he woke, I dosed him with some baby Tylenol and forced him to endure a full three minutes of kisses from Mommy (which he dislikes about as much as a head injury) and realized that the one “con” I didn’t weigh was my own guilt. After he safely woke and sat at the table to have a snack with his brothers, I thought about this experience. I knew that for a long time afterward, I would worry I’d done the wrong thing and regret not having him checked out. If he grew to have a lisp one day, I’d probably blame myself, assuming he’d damaged whatever parts of the brain control speech. If he had difficulties in school, I’d certainly hold myself responsible. And if, one day as an adult, he decided to wear socks with sandals, I’d smack him a little. That’s just ugly. But it was clear I’d carry this fear and guilt with me forever. That’s when he fell backward off the dining chair. 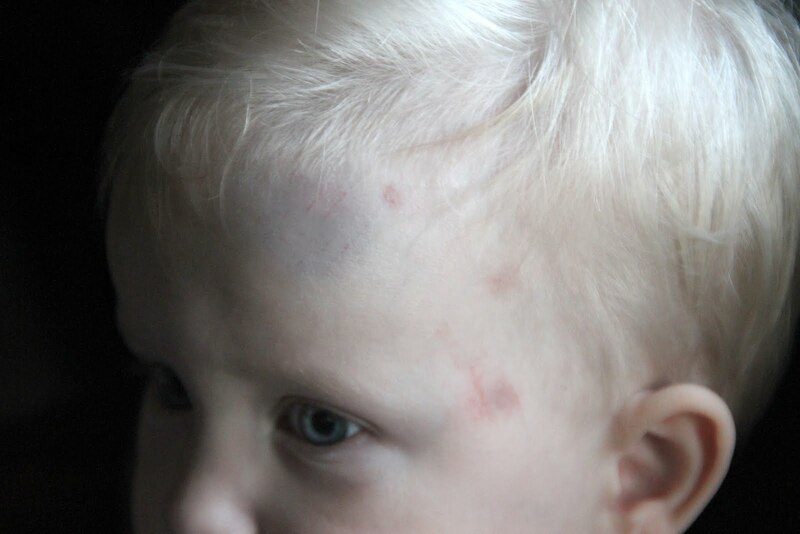 Did I mention that I have accident prone kids?